What a marvelous Easter Season surprise, following that of the Hosta flowers that had us mesmerised too! 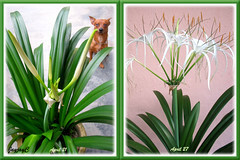 We didn’t even know that we were growing Caribbean Spiderlily (Hymenocallis caribaea) since last August until it flowered recently. Even Annette, a wonderful friend who gave us three kinds of Hippeastrum bulbs then, was positive that she parted with ‘Mrs Garfield’, a pink and white hippies and two other red hippies, no Spider Lilies or White Lilies whatsoever. She was as surprised when she received two images of its stunning blooms via email a week ago and was told that we had grouped the Spider Lilies with a couple of red hippies in the same pot mistakenly! 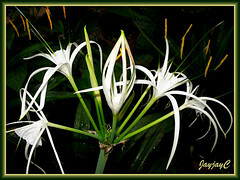 Caribbean Spiderlily is such a common plant seen frequently growing en masse along roadsides and other public areas in our country, Malaysia that we have taken its beauty for granted and consider it so ordinary. But, when tendered with love in our garden, it’s a different relationship altogether. Sort of personal and intimate, eagerly wanting to know more of the plant and it becomes a treasure to behold, especially when it comes of age and bloom for the first time ever! Initially, we were a little disappointed when we noticed that it wasn’t to be a red hippeastrum as anticipated, but it faded as quickly when we (especially I) became fascinated with the whole blooming process of this extraordinary beauty. 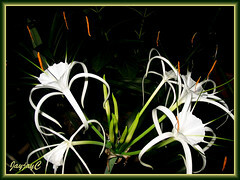 I only guessed it to be a White Lily from the shape of its flower buds. Hence it was monitored closely and that was easy as the potted plants were at our backyard, within close view from the kitchen and easily accessed. The next day, I watched like a hawk but nothing happened until evening came and another bloom was added and again accompanied by the lovely fragrance. Humph…didn’t get to see how the flower opened up! I was gardening again in the front. Aargh, missed again for two more subsequent evenings! By Sunday evening the 26th, I decided not to do any gardening at all (hehe…prevented too by a slight drizzle) but to wait patiently at the kitchen door to see how the blooms will unfurl! As anticipated, around 6.15pm, one long torpedo-like bud started to unfurl and burst forth in a flash within less than a minute, followed by two other buds blooming in rapid succession. It took approximately 3 minutes for 3 buds to break open, that’s about a minute each. So lovely to observe! And, almost instantly, the fabulous scent and attractive orangy pollen became a magnetic field for nectar-seeking insects and pollinators like the hover flies and ants. In fact, by mid-morning the next day, they would have devoured all the pollen. We thank and praise God for this exceptionally wondrous experience! How awesome is His creation and divine art! 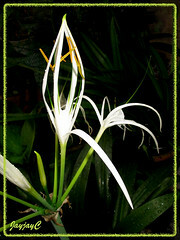 Just to record some approximate measurements of this Spider Lily that so captivated us. Flowering scape measured 60-62 cm tall, with a huge flower head 30-32 cm in diameter with 11 flowers. 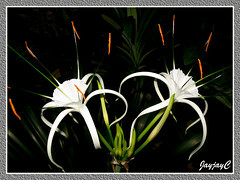 Flowers lasted for 2 to 3 days and as one or two withers another one or a few buds will open. Buds ranged 21-24 cm in height, pedicels 10-12 cm, funnel-shaped corona 5 cm across, stamen stalks (6) extending from the edge of the corona cup 6 cm long with anthers 2 cm long and covered with rich orange pollen, a greenish style 11 cm long extending from inside the cup and overtopping the stamens, and thin elongated tepals (6) up to 13 cm long. The flowering scape of 11 flowers was finally exhausted yesterday, just 9-10 staggered days of splendid performance. Caribbean Spiderlily, a low-maintenance bulbous perennial, is so easy to grow in tropical conditions, happy with lots of sunshine, humidity and moisture. Strongly recommended for tropical and subtropical regions! 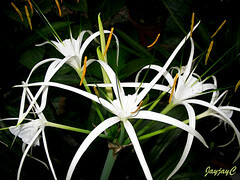 More plant info on Caribbean Spiderlily here.